This week marks the anniversary of Ghana’s Independence, the first sub-Saharan state to diverge from European rule. The country inherited English as its main language due to the British Empire’s control of the area, but there are now nine government-sponsored languages, including Twi and several of its dialects, and Ga, the oldest recognised Ghanaian language. In this blog we’ll have a look at the history of Ghana, through its independence process to its current state of affairs. Following the “scramble for Africa” The British Empire’s colonial rule over Ghana began in earnest on the 24th of July 1874 and lasted nearly 70 years; over this period the British made use of Ghana’s vast natural resources – it gained its colonial name the “Gold Coast” due to its large deposits of the valuable metal, as well as other natural commodities. As money flowed through the region, towards the beginning of the 20th century The Gold Coast saw significant economic and social development and became something of a ‘showpiece’ colonial state for the British, and as more Ghanaians became educated, the seeds of nationalist thought and independence were sown amongst this new elite-African class. By the end of the 2nd World War, the tide was turning against the British Empire, and indeed marked the decline of all the European empires. The War had left Britain nearly bankrupt, and unable to retain the same level of control over its colonies; this dovetailed with the rise of educated Ghanaians, the return of disenfranchised War veterans (ripe for nationalist ideology), the recent Indian declaration of Independence and the teachings of Mahatma Gandhi and its influence on Kwame Nkrumah, the eventual first Prime Minister of Ghana. With the change to Britain’s foreign policy, Kwame would eventually navigate his way through Ghana’s political system and gather mass support for Ghana’s Independence, and the country celebrated its first day of self-governance on the 6th March 1957. So how has Ghana fared since its liberation? After Kwame was overthrown in a coup d’état by the military, Ghana experienced some rough patches politically and economically, but since the elections of 2000 it has seen legitimate transfers of power from one head of government to another, and is now considered a stable democracy. Ghana is economically strong due to its natural resources and its comparatively good management, and an indication of how well the country is doing is its healthy tourism industry. Since its independence Ghana has come to be seen as one of the leaders of Africa, and it looks likely to continue in that way. 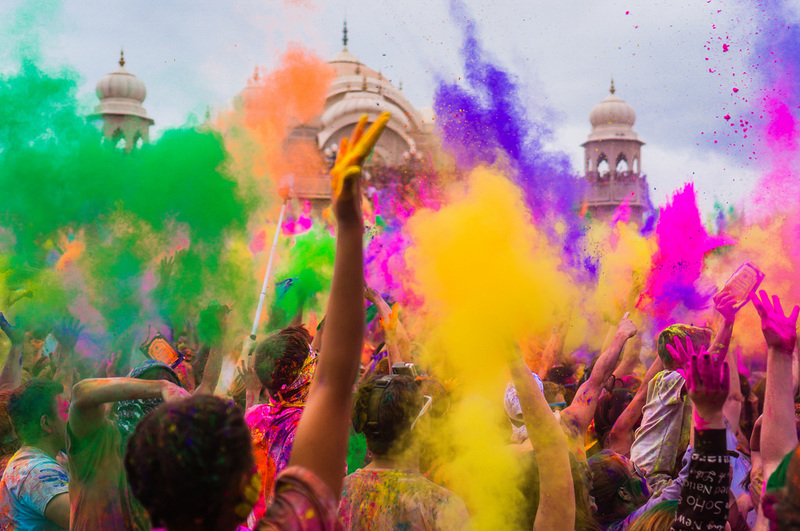 Holi is an ancient spring festival celebrated initially in India but has spread throughout the continent and even through to Europe and the United States. The festival is a celebration of the triumph of good over evil, coming from one of the many symbolic legends of Vishnu. The event tends to take place in late February or early March, and this year it falls on the 1st of March. According to Hinduisms Mahapuranas (the Great Histories or religious texts) a Demon King named Hiranyakashipu had received a blessing which made him near-immortal; he could be killed by neither human nor animal, neither day or night, outdoors or indoors, nor by projectile or handheld weapons, or on land, air, or water. In his invincibility the Demon King grew arrogant and forced all to worship him. However, his own son Prahlada disobeyed him and still worshipped Vishnu, which infuriated Hiranyakashipu and he subjected his son to extreme punishments, none of which weakened Prahlada’s resolve. Finally, the Demon King’s sister Holika (the festivals namesake) wished to trick her nephew into his death; she wore a cloak that was immune to fire and got her nephew to sit on a pyre with her, but as the flames began to rise the cloak flew from her to Prahlada and she burned. In this moment Vishnu appeared as Narasimha – half human half lion– and took to the Demon King at dusk, forced him to his doorstep which was neither indoors nor outdoors, sat Hiranyakashipu on his lap which was neither land, nor air, nor water and ripped him apart with his lion claws, which were neither projectile nor handheld weaponry. Religious persecution was then banished from the land and Prahlada ruled peacefully over it. Holi is one of the most culturally significant festivals in Hinduism, as it marks the victory of good over evil, a day to forgive oneself and others of past errors and the beginning of spring in India. Preparations begin the night before Holi, in the Holika Dahan, a bonfire to celebrate the burning of Holika and the banishment of evil. The following day features the event that the festival is famous for: Rangwali Holi - the paint fight in which everyone is a possible target, regardless of age, status or gender. The day is generally without prayer or religious ceremony and is purely for fun and enjoyment. Though these two features of Holi are pretty much staples wherever the festival is taking place, other events occur depending on the region such as in Mathura in North India, where the festival last a week rather than two days, and women playfully beat shielded men with sticks after the paint fight. So, on behalf of Vandu, Happy Holi to all our friends and colleagues! At Vandu we provide interpreters and translations for many of India’s languages, such as Urdu, Punjabi, Bengali, Hindi and Tamil. Please call 01273 473986 or email info@vlslanguages.com for more information. The Chinese New Year lands between the 21st of January and the 20th of February; This year it began on the 16th of February and for the next two weeks the Chinese community will be celebrating their New Year. The ‘Spring Celebrations’ are centuries old, steeped in tradition and have many customs due to the legend and myths that have accumulated around it over the ages. Part of the culture that surrounds the Chinese New Year is the tale of Nian. Nian is a mythical beast that was said to terrorize a village at this time of year due to scarcity of food; it would come and eat the villagers, particularly the children, and the village took to hiding in the nearby forest. Eventually an old monk stood up to the beast and painted the town red, as well as setting off firecrackers. His plan worked, and these traditions can be seen today in the New Year celebrations. The Chinese Zodiac is an ancient classification scheme that assigns animals to each year in a repeating 12-year cycle. Originating from a 2000-year old myth – of which there are several versions – it’s said that the Jade Emperor wished to see what the animals of Earth looked like and held a race to Heaven. The drama unfolded at the river crossing, where the animals would display their stereotypical qualities – the snake hitched a ride on the horse and surprised it just before the finish line, the ox gave the rat a lift, the pig was lazy and came in last. The traits are reflected in various ways depending on the version, but in every adaption the rat betrays the cat, either by drowning it or keeping the race a secret; this is claimed to be why cats chase and kill rats. Though specific traditions vary depending on region and culture, the annual reunion dinner is a staple throughout and is thought to be the largest annual human migration in the world. Red is considered a lucky colour in China, and is commonly seen at this time of year due to the Nian legend; red lanterns are lit and sent up in to the sky, and money-filled red envelopes or hóngbao (Mandarin) / lai sze (Cantonese). The money in these envelopes are always even numbers, as uneven numbers are associated with funerals. Another staple is thoroughly cleaning the house; this is meant to signify cleaning away bad spirits and making space for the good ones. Though apparently originating from a questionable Roman festival (though no one can pinpoint the exact origin), Valentine’s Day was popularised by the Catholic Church, and then later romanticised by Geoffrey Chaucer and other writers. Fast forward to the 14th February in 21st Century and the notions of religion and strange festivals have faded away, but the idea of love and devotion are stronger than ever… let’s have a look at how the special day is celebrated around the world. Similarly to our Western version of Valentine’s Day, the Philippines enjoy gifts, nice food and spending time with one another; but interestingly, it’s common for people to take it that step further, and actually get married on the day! This tradition has led to mass weddings in shopping malls, parks and other public spaces, where people get married one after the other as well as renew their vows. Thousands of Filipinos now share this wedding date, which has only heightened the fervour for this day of the year. Wales celebrate their version of Valentine’s day on the 25th of January, and the day is actually dedicated to the Welsh saint Dwynwen. One of the more interesting traditions of this Welsh holiday is the love spoon (no that’s not a euphemism); these spoons are carved out of wood and have symbols etched into them, which can signify different meanings such as horseshoes, which stand for good luck; wheels, which symbolize support; and keys, which symbolize the keys to a man’s heart. China’s equivalent of Valentines day has a classic love story behind it. The Cowherd and the Weaver Girl is a myth that is believed to be 2600 years old and revolves around the title characters. The weaver girl is bored of Heaven and travels down to Earth where she falls in love with a lowly cowherd; subsequently the gods find out about this love and the pair are separated, save for one day a year when a flock of magpies make a bridge between the two realms and our lovers are reunited. Chinese tradition dictates that paper offerings are burnt at temples, and newlyweds might worship the celestial couple one last time as they begin their own relationships. One of the most important things about Valentine’s day here in England is the Valentine’s card. The Earliest known version of this is a poem called ‘Farewell to Love’, written by a medieval French Duke named Charles, of Orleans. A classic Valentines evening might consist of going somewhere for dinner, perhaps a movie, maybe a walk and an exchange of gifts. Its easy to take speaking a language for granted – throughout history, throughout the animal kingdom, there is no better method of conveying thoughts, ideas, humour or our deepest emotions. But how do we speak to others who don’t communicate in our language? In this blog we’ll look at the ways we communicate without actually speaking (or writing) to one another. Body language is perhaps the most universal language on the planet, as we share this means of communication with the animal kingdom; when frightened humans and animals tend to retreat and make themselves small, and the opposite is true when confident or attempting to threaten. And while different cultures vary, generally body language stays the same throughout humanity. The things to look out for when reading body language are eye and body contact, proximity and facial expressions. If there are aspects of body language that are up for debate, very little can be said for body contact. A person knows what is being said when receiving a hug or a reassuring touch, or conversely, when being pushed or punched. There are two forms of body contact; one being private contact, which takes place in a place away from other people, an example of this would be sexual activity. The other is public contact, such as a handshake – speaking of which, handshakes are surprisingly layered in terms of communication; it can be used to greet, but rejection of a handshake can be a serious affront, and between restrained men it can be an expression of affection and love. Furthermore, a handshake can mean a sign of trust, or forgiveness if there has been tension between two people. Is there a better way to express yourself than through art? A recent study suggests that there are recognisable moods in songs throughout the music world – songs you would dance to, or lullabies and soothing songs. Furthermore, the language of music called notation, is fairly standardised around the planet, particularly in professionals. Beyond this, the artwork that hangs in famous museums attracts people from all corners of the globe – and though the finer details of the meaning and message may be debateable, the general mood can be read regardless of where you’re from. The same goes for dance and any other artform; the human nature is present and reflected within these methods of communication, and emotion is something we all experience, and therefore can all relate to.